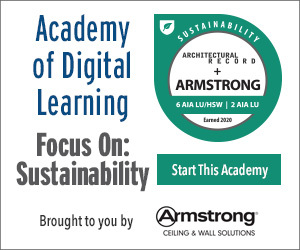 The project’s seismic resilience has been accomplished primarily with elements found in many Bay Area multiunit residential buildings, including reinforced-concrete floor plates, columns, and shear walls. But at Casa Adelante, these largely conventional components have been tuned through sophisticated computer simulations. “Their dynamics have been considered all together, as a system, to make some parts stronger and others weaker,” explains Mar, the project’s structural engineer. The idea is that the building will realign itself after an earthquake’s shaking, behaving in a manner similar to the new ­library in Christchurch. The tower’s seismic strategy comprises a dual system of a perimeter moment frame and composite megacolumns and a steel megabrace, all rising from a foundation that includes piles socketed into bedrock, more than 200 feet below the street. Earthquake-resistance is dependent almost entirely on these perimeter elements, since the slenderness of 181 Fremont—with a base that is only 120 by 90 feet—did not permit a structural core in the office portion, which occupies the lower 37 floors. But above, in the residential levels, there is a secondary system, with a core reinforced with buckling restrained braces. The tower is designed to uplift slightly, about an inch, in a large quake—one known as a maximum considered earthquake, or MCE, defined by code as a seismic event that has a 2 percent chance of occurring in 50 years. Each megacolumn includes a shear key, which was devised to allow forces to be transmitted to the foundation without the tower moving side to side, explains Almufti. 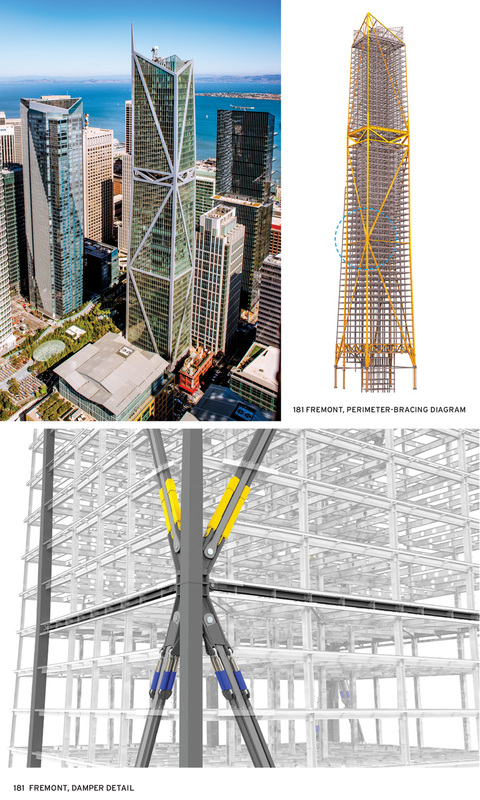 San Francisco’s 181 Fremont, which sits adjacent to the currently closed Salesforce Transit Center and its rooftop garden (top, left), has composite megacolumns and a steel megabrace (top, right) to help it perform in an earthquake. Dampers are integrated into the megabrace (bottom). As part of their work on 181 Fremont, the engineers also considered nonstructural ­elements, since repairing or replacing such components can be costly and delay reoccupancy. For instance, a full-scale, three-story facade mockup was used to confirm air- and watertightness after the shaking of a 475-year quake.